Yet another strawberry themed item for Valentine's Day? Yup! I told you guys, candy companies went strawberry-crazy this season. 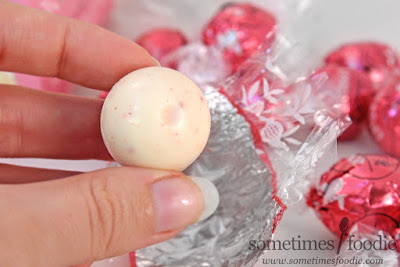 When it comes to strawberry flavored chocolate sweets I still think a white chocolate base is best, since a milk chocolate one can overpower everything else, and thankfully, Lindt felt that way too, because these truffles are white chocolate based! Sure, there are some exceptions to the white chocolate rule. I mean, I absolutely love Ghirardelli's Dark Chocolate Strawberry Squares, but so far all of the other strawberry and chocolate variations have been pretty lackluster. Lets see if a white chocolate base can really make a difference! I know the nutritional image is a little rough and not as polished as my other photos, but can we just take a moment here to appreciate that the serving size is measured in "balls?" It's fantastic! Serving size 3 balls? For such a snooty grocery store luxury candy brand to describe it's truffles as "balls" just makes my day. Once we look beyond the balls, giggity, the rest of the packaging is festive, colorful, and classy while maintaining a sense of fun and whimsy. I love the curving pattern of hearts that turn into a delicate lace pattern, and the foiled accents are used sparingly. Usually novelty flavors and products look cheesy, but Lindt and Ghirardelli always manage to look sophisticated while still fitting in with the rest of the seasonal crowd. 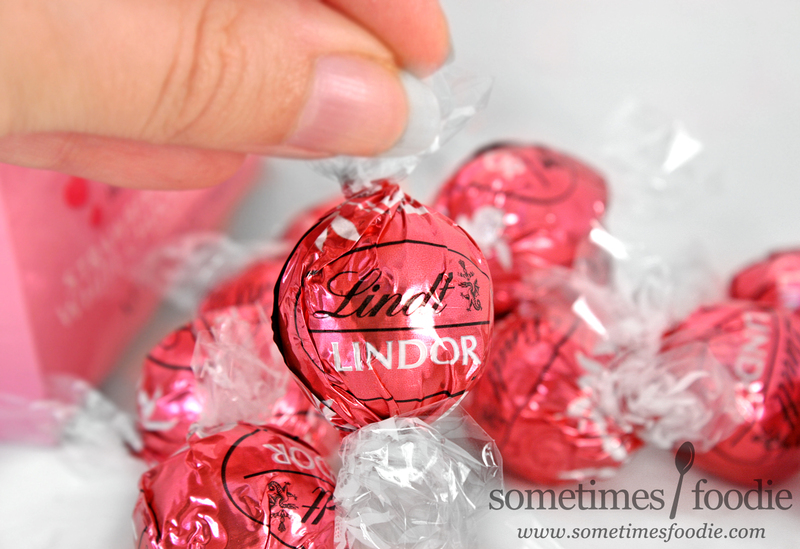 I've tried a few of Lindt products over the years, and though I haven't liked everything I've eaten, the designs never disappoint. Is a pink-tinged, melt-in-your mouth, strawberry infused white chocolate ganache. This filling is really rich and buttery, and melts quickly on your tongue! I love the filling, but the white chocolate shell on the outside melts more slowly, and it's really sweet, which I didn't care for. I felt like the outer shell's sweetness overpowered the strawberry flavored insides, especially since it melted so slowly by comparison. When I ate these I tried to nibble as much of the white chocolate layer off as possible before popping the strawberry core into my mouth, because I like the filling a lot more than the truffle itself, but I seem to be the minority. My boyfriend, his sister, my sister and my mother all love these as-is! It really depends on how intensely sweet you like your white chocolate to be. I like mine to be milky and mild, and with a candy like this, I want the strawberry part to really shine. 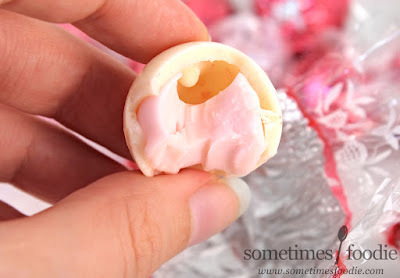 The filling is everything I wanted in a white chocolate strawberry candy, but the shell is too sweet for me. 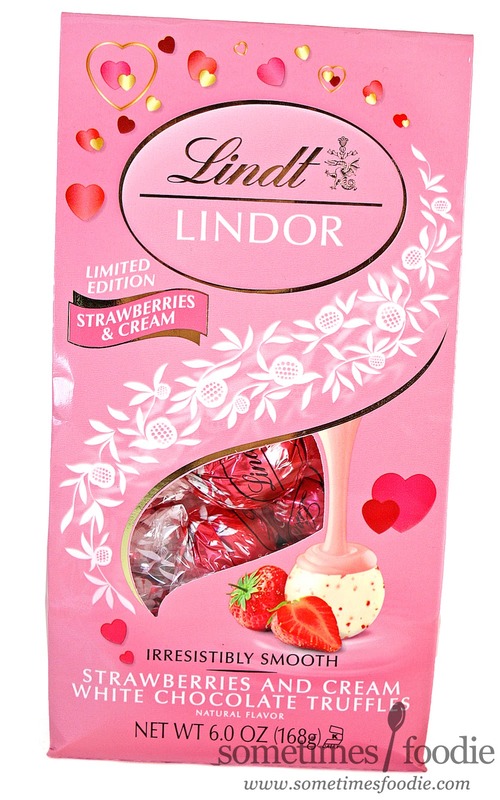 I wouldn't buy these again for myself, they're just too sweet, but I am buying bags for all the people I mentioned above for Valentine's Day. These things were a hit with the rest of my family, so if you like your sweets extra sweet, and creamy, these are a limited edition candy worth looking into and stocking up on.